Padraig Harrington works with a conventional putter at Doral. This week he plans to use a belly putter in competition at Quail Hollow. Just over a year after insisting that he was against the belly putter and felt it was “only a matter of time before they are banned” Padraig Harrington has taken the shocking decision to join the anchored putter brigade in the Wells Fargo Championship at Quail Hollow today. The Dubliner, 41, has suffered on the greens over the past few seasons and bar his win in the Asian Tour’s 2010 Iskandar Johor Open, he has not won on either the European or the PGA Tour since capturing the most recent of his three majors in the 2008 US PGA at Oakland Hills. An R&A ambassador, Harrington revealed the news on his blog, writing: “The main thing that I changed in the last week is my putter. I was at home last week and I was messing around with a belly putter and it felt very good. Having missed a hatful of putts in the final round of the 2012 Masters, Harrington was asked if he had considered moving to the belly putter and immediately ruled it out. The Dubliner delved even deeper into the controversial issue of anchoring and the PGA Tour and PGA of America opposition to the proposed ban on anchoring the club to your body. Speaking ahead of the WGC-Cadillac Championship at Doral in March, he said: “If they [R&A and USGA] are stopped from changing this rule, they have no function going forward or their functionality is extremely hindered going forward. That’s how big a deal it is. “My attitude towards it is that every time someone uses a long putter, it is controversial because the TV commentators are making a comment on it. Every time they see a long putter, there is a comment. Harrington was asked about long putters in general during The Open last year, where he finished 39th behind belly putter user Ernie Els at Royal Lytham. “I suspect that they (the R&A) are going to ban them,” Harrington said. “That’s more or less the consensus - they’re going to have a two-year grace a bit like the grooves. “Guys wouldn’t be using them if they didn’t putt better with them. If the standard of putting goes up, it puts more pressure on the guys that aren’t using one just to compete. “So all of a sudden it’s hard for a normal putter,” he added. “Is he doing the right thing, should he be using the long putter? “The fact is, if somebody invented the belly putter tomorrow, it would not pass. I think we could all agree with that. The only reason it got through is the people that used it 20 years ago were coming to the end of their careers,” he said. Harrington appears to be trying to extend his career by going to the belly putter. With the R&A and the USGA expected to announce their decision on the proposed ban in the coming weeks, his timing is unusual given his role as an ambassador for the R&A, who are the prime movers behind the bid to ban anchoring. Harrington tees off at Quail Hollow at 7.50am local time (1250 Irish time) with Andrew Svoboda and Trevor Immelman. Pádraig Harrington lines up a putt on the ninth at Quail Hollow. 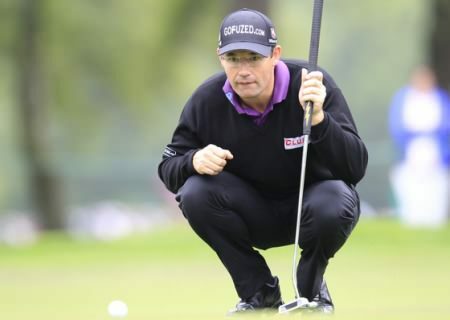 Picture: Eoin Clarke www.golffile.ieWatching Padraig Harrington use a belly putter for the first time is a bit like watching Picasso use a paint-by-numbers kit to produce Guernica - you know it’s wrong but you just can’t look away. Phil Mickelson chips to the 10th at Quail Hollow. Picture: Eoin Clarke www.golffile.ie. Padraig Harrington’s landmark first event with the belly putter ended with another first - he finished joint last in a strokeplay tournament for the first time since he turned professional more than 17 years ago. Pádraig Harrington lines up a putt on the ninth at Quail Hollow. Picture: Eoin Clarke www.golffile.iePádraig Harrington will give the belly putter a second chance in practice at Sawgrass this week before deciding if he will use it to try and banish the demons of his worst performance as a professional. McIlroy's Olympic saga: "I still have a choice. It's not like they can take it away from me"